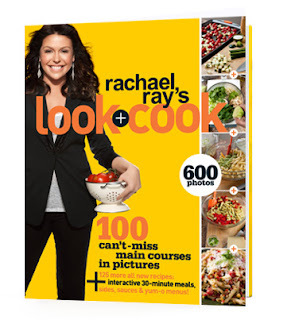 Rachael Ray has a new cookbook coming out on November 2, 2010. The title is Look + Cook and it includes over 200 new recipes and 600 photographs. Rachael doesn't usually include that many pictures of the food, so that will be a treat. There are pictures from four steps of the recipe and then a picture of the main dish. Sounds like a fun concept to me. This book is organized in the traditional way: starters, sauces, sides, and main courses. I have to say I prefer the set up used in 30 Minute Meals 2 (and other Rachael Ray cookbooks), where each recipe includes a side, starter, drink, or dessert. You just open up to the recipe you want to make and there's two or three recipes that are intended to go together. I might be lazy, but I like Rach to do the thinking for me regarding what goes with what. Otherwise, I end up making the same sides over and over again. I'm thinking all the recipes aren't 30 minute meals, which is fine with me. Sometimes on the weekends I'm interested in cooking something that takes longer. I'll keep an eye out for more details! This is one of my favorite cook books in my collection. I would highly recommend this book to anyone. Every recipe is a win! I totally agree. Everything I have made from it has been awesome!